Illustrated talk explores the meaning and function of Cairo’s Friday mosques as discussed in a collection of legal opinions (fatwas) by the 14th century Sunni jurist al-Subki. 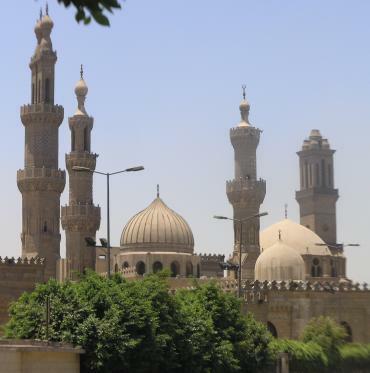 For a city famous for its soaring minarets and magnificent architecture, Cairo has surprisingly few Friday mosques dating before the Bahri Mamluks who ruled between 1250 and 1382. Historians, geographers, and Muslim legal scholars (‘ulama’) discussed the inadequate available space for Friday prayer in the city, and described how crowded the few existing mosques were with rows upon rows of worshipers filling Cairo’s alleyways and markets on Fridays. This illustrated talk explores the meaning and function of Cairo’s Friday mosques as discussed in a collection of legal opinions (fatwas) by the 14th century Sunni jurist al-Subki (d. 1355). Al-Subki puts forward an elaborate treatise using the historical development of Friday mosques in Cairo between the 8th and 14th centuries to explore two interrelated issues: 1) the location, space, and adjacencies of the Friday mosque, focusing on the permissibility of multiple Friday prayers in one city; and 2) the nature of government and political authority, focusing on the Friday mosque’s role in reaffirming the role of the caliph and/or his representatives. Ruba Kana’an is a grantee of The Barakat Trust and is Assistant Professor of Islamic Art and Architecture at the University of Toronto, Canada. Ruba Kana’an previously was Head of Education and Scholarly Programs at the Aga Khan Museum, Toronto (2011-17) and Noon Chair of Islamic Studies at York University, Toronto (2008-11). Ruba Kana’an, who was born in Ammam, Jordan went on to Oxford University, where she studied Islamic art and architecture, and then taught it. “I developed, wrote, and taught the first on-line course in Islamic art.” It remains the only credited online course in its field. This event has very kindly been sponsored by The Park Gallery, who have provided the venue. The Park Gallery specialise in Modern and Contemporary Middle Eastern Art. If you are unable to attend the event why not support the work of The Barakat Trust by making a donation by clicking here.